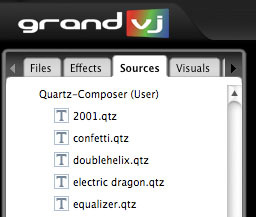 Quartz Composer can be used in GrandVJ as .qtz files, we render them natively through the fastest interface. 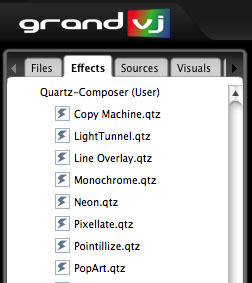 Before GrandVJ 1.2 you needed to save them as QuickTime movies, this had 2 big drawbacks, it was slow and it did not allow to change compositions variables. 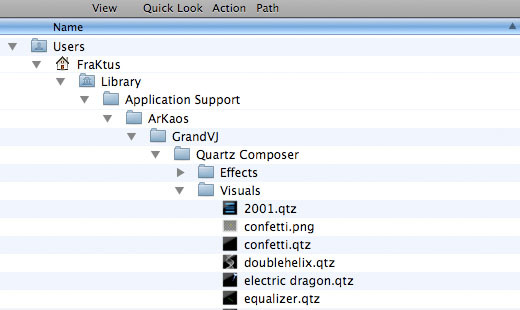 With the Quartz Composer integration we have a fast rendering path and compositions can be used both as sources and effects. When a composition is used as a source you simply import it the same way than any movie, you drag and drop it over the interface or use the file browser. When a composition is used as a source you cannot change any composition variables from the GrandVJ interface. A composition can also be used as an effect. 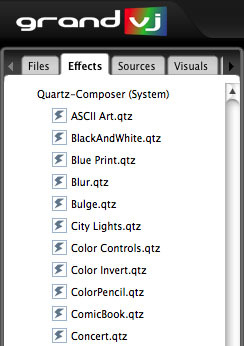 We scan automatically the system folder “/System/Library/Compositions” and register the ones that can be supported by the application, you find them under the “Quartz-Composer (System)” section in the effects. You can use them as source to develop new effects. 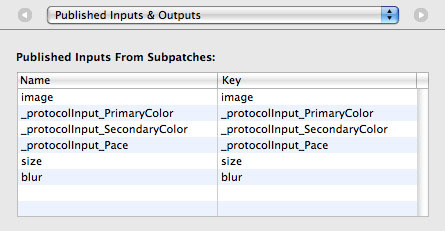 When using a composition as an effect the application scan the published inputs and map them as effect parameter when the format is compatible with the engine. We map parameters that are float values, indexes, colors and booleans. One visual input of the composition receive the assigned cell visual. You can see that GrandVJ try to extract the meaningful part of the parameter name, so it remove all _ProtocolInput strings from parameter names. Not doing that would make it impossible to display the full name in the panel. GrandVJ also capitalize the first letter of a parameter, so “size” become “Size”. 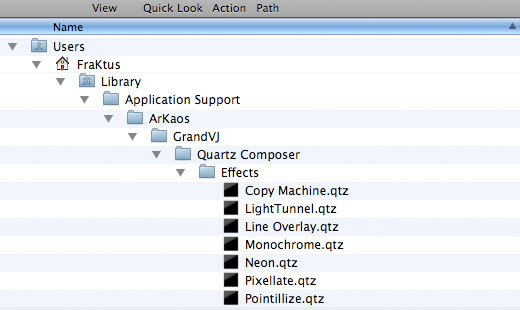 And finally if you want to have compositions in the visual sources we ship a few in the “Libray/Application Support/ArKaos/GrandVJ/Quartz Composer/Visuals”, the idea is that you can add more files in this place.